In November, 2006, the Nazareth College Womens’ Soccer team won its seventh Empire 8 Conference (E8) championship. Three players made the 2006 E8 All-Star first team: senior midfielder Rosie Simiele, sophomore back Ashley Clinton, and sophomore midfielder Rachel Cushman. Rachel wore No. 9. After three straight years of elimination only by shootout after the E8 championship game, Nazareth began the 2006 NCAA Tournament on November 11th, at Elizabethtown, NJ, against Montclair State. In April, 2007, Angela’s first cousin once removed Bob Coniglio, Assistant Principal at Frontier High School, became the eleventh of her relatives to receive the Angela Coniglio Cousins Scholarship, as he works towards his goal as an education superintendent in the Superintendents Development Program, through SUNY Oswego. Bob went on to become Assistant Principal at Clarence High School. Jackie Miller‘s daughter Emma Belkin Feingold also received the Cousins award. On May 24, Christine Domres became the eleventh Amherst Central High School senior girl to receive the Angela Y. Coniglio Memorial Scholarship at ACHS. Christine has been a perennial star on the school’s Section VI championship teams in Varsity Field Hockey and Varsity Lacrosse. She continued her education at the State University of New York at Fredonia (Fredonia State), where she majored in Special Education. 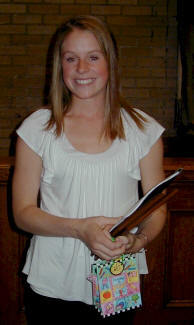 Daisy Timlin was awarded Amherst Central High School’s Angela Y. Coniglio Memorial Scholarship at the school ‘s Awards Assembly on May 22, 2008. Daisy (who has sisters named Ivy and Lily) is an excellent student who starred in Tennis, Basketball, and Lacrosse for the Lady Tigers. She was a four-year tennis player who helped Amherst win the Division II tite in 20007 at second singles. 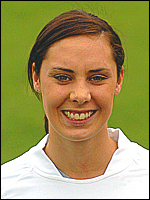 A captain in 2008, she was also a co-winner of the Coach’s Award. A three-year member of the varsity basketball program, Daisy was a co-captain in 2008, using her athletic talents to excel as a guard, handling the ball and becoming a defensive specialist throughout her senior season. She contribute 51 points, 31 steals, and 42 rebounds over the winter, and was the recipient of the Coach’s Award and the Dedicated Bob Hettler Award, for the ‘07-‘08 season, appropriate, since Hettler was Angela’s coach. Daisy also played on the Lacrosse team, which won the sectional playoffs, with Daisy scoring five goals. Her personality, enthusiasm, and hard work guarantee her future success at St. Bonaventure University, at Lacrosse, and in her chosen field, Education. Daisy sent us a letter (see the Appendix), which only reinforces our pride in Angela, for inspiring such a fine young lady. On May 21, 2009, the recipient of the Angela Y. Coniglio Memorial Scholarship at Amherst’s Awards Assembly was Eva Lankes, a multi-sport, multi-year award winner in Women’s Varsity Swim, Women’s Varsity Softball, Women’s Junior Varsity and Varsity Basketball, and Women’s Varsity Softball. In her Senior year she was the Softball captain as well as captain of the Basketball team that won the Section VI Class A Championship. She has won, among other awards, the Softball MVP and All-WNY honors; the Basketball Tiger Award, and the Bob Hetler award, and has set several Swim records, including the Women’s Varsity Swimming 400-yard freestyle relay, 200-yard freestyle relay, and the 200 yard medley relay as a Junior, as well as a school record and championship in the ECIC 50-yard freestyle competition. 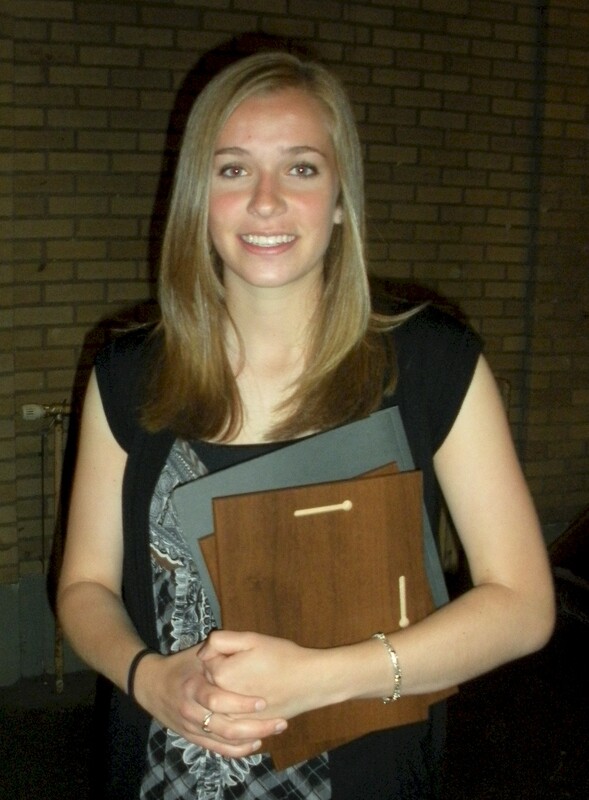 Eva attended college at Suny Brockport, majoring in Education and competing on the Swim team. See the Appendix for her note. In June 2009, three children of Angela’s first cousins received the Cousins Scholarship: Alessi Jacqueline Miller (Matt Miller), Lauren Michelle Silvestro (Jean Coniglio), and Amanda Jill Skinner (Ronald Andrew Coniglio). Congratulations to the Class of ’09!